Joe has worked for MCRCD since 2011. As MCRCD’s fisheries biologist program director, Joe works with landowners to develop restoration projects and seeks implementation funding to assist with landowners’ costs. 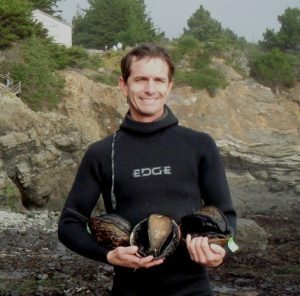 Joe earned his master’s degree in fisheries from Humboldt State and has managed fisheries restoration and water quality projects in Mendocino County since 1998. Prior to joining MCRCD, Joe served as the Director of the Mendocino Fisheries Program and Water Resources Specialist for the Mendocino County Water Agency. In that position, he worked on water conservation and pollution prevention programs throughout the county. He is a Qualified Water Efficient Landscaper, certified through the US EPA WaterSense Program, to perform residential and commercial water audits. Joe maintains a Scientific Collecting Permit, required to perform surveys for spawning salmonids. His habitat assessment training for California red-legged frogs has been useful in project implementation in the Garcia River and upper Russian River.